In this day and age, people and businesses alike have more security concerns to worry about than ever before. We all carry around devices that contain sensitive information, and hackers are always looking for new ways to get into our computer systems. While we rightfully take precautions to protect our computers, smart phones, and networks, we sometimes overlook simpler devices. We live in a time where every new device is given Internet capabilities. Thermostats, coffee makers, televisions, and watches all can connect to our networks now, and this poses a new security risk. 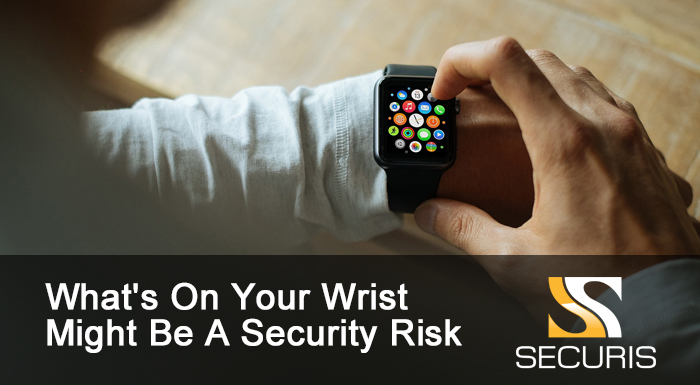 If you’re one of the millions of people who currently wears an Internet-connected device on their wrist, you may want to think about the possible security risks. There are two main ways that wearables – particularly fitness trackers and smart watches – present a security risk. For starters, they store a lot of personal information. Even basic fitness trackers know your birthday, age, and weight, along with the number of steps you take in a day, your average heart rate, and, in some cases, your location. These devices typically come with less protection, making all of this personal information more accessible to hackers. On top of this, wearables provide a gateway into any devices or networks they’re connected to. A sophisticated hacker could upload malware to your wearable device, which then transports it back to your smartphone or computer. While the likelihood of this sort of attack happening is low, that doesn’t mean that it should be ignored. If you want to make sure that your information remains safe – particularly if these devices are connected to business-related networks or devices – there are a few things you can do. First, if the devices are a part of a company-wide program, you should set up a separate network for them. This will isolate all devices to one network, and prevent them from having access to sensitive company equipment or information. Next, whether you’re a business or an individual, you’ll want to know what sort of personal information your device has. For instance, if you’re uncomfortable with storing your location on your device, you might want to turn off the GPS feature. Or, don’t store your full name along with your birthday. Companies need to know what sort of information they’re collecting from these devices. There are regulations in place regarding the collection of information, and companies and agencies want to make sure they’re in compliance. Finally, if a device breaks, or you decide you no longer wish to use one, it’s important that all information is wiped from the device. Data destruction is an important aspect for all electronic devices, and your wearable is no different. You’ll want to ensure that all information is being properly erased from the device, rather than simply throwing it out. To do this, talk to an IT recycling or hard drive shredding company to ensure the process is completed right. Just because a device no longer works, doesn’t mean there isn’t personal information still stored on it. We have grown so accustomed to everything being connected to the Internet these days, that we often forget there are security risks involved. Don’t let yourself grow complacent, and treat any wearables you might have the same way you treat your smartphone or laptop. Wearables might not be the biggest security threat around, but if the time comes when someone does try and hack into yours, you’ll be happy you took precautions. To learn more about how to properly erase data from your wearable devices, please contact us at any time. We would be happy to discuss ways to keep your information safe, both while you’re using the device, and after you’re done with it.